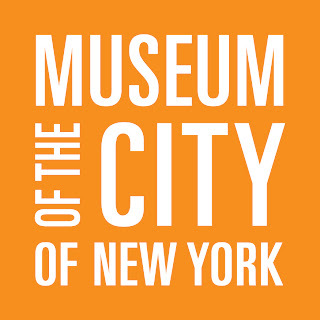 Dear Readers, if you haven't had the chance to make it to the Museum of the City of New York to see its landmark exhibition "The American Style: Colonial Revival and the Modern Metropolis," then you have just a few short days—until Sunday, October 30th—to do so. Reggie urges you to throw off any and all excuses and get yourself up to the Museum and take in the show, and he urges you to also buy the exhibit's accompanying beautifully written and profusely illustrated catalogue. 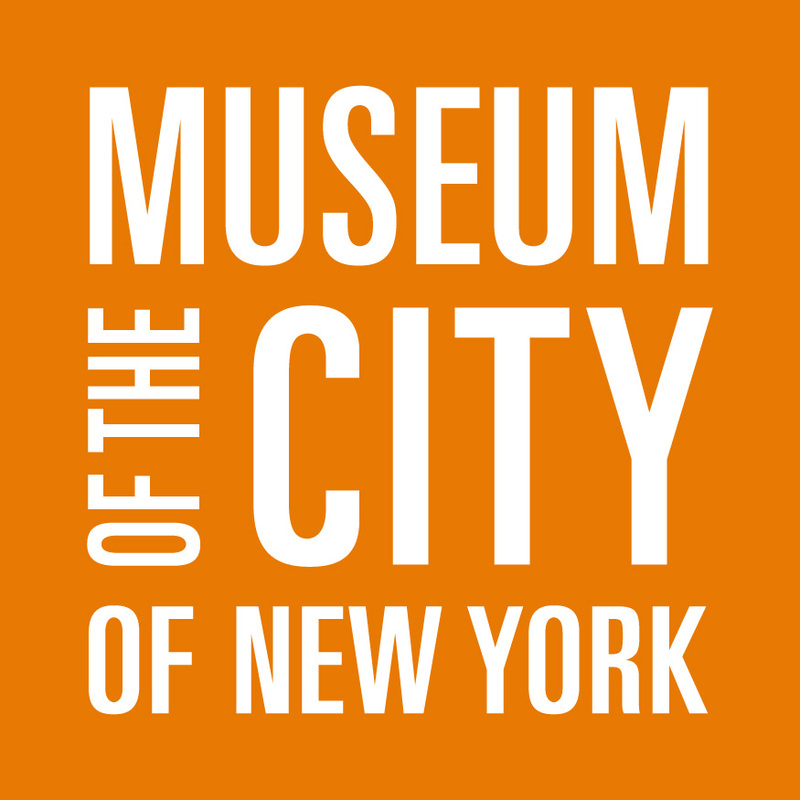 This is an important exhibition, and one that people will be talking about, and writing about, for years to come. Don't miss it! 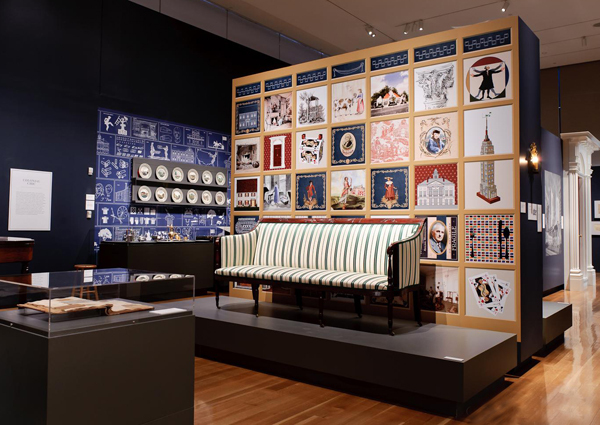 "The American Style: Colonial Revival and the Modern Metropolis"
Thoughtfully and creatively curated by Donald Albrecht and Thomas Mellins, and beautifully designed by Peter Pennoyer Architects, the exhibit is an absolute gem, and one of the first to explore in depth the quintessentially American style of architecture and decorative arts popular in the first half of the twentieth century that was inspired by the Colonial and Federal eras. 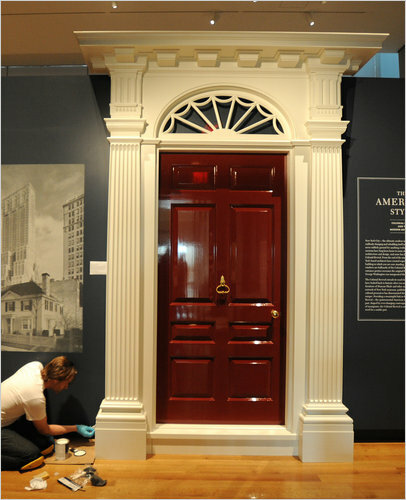 The Colonial Revival movement first gained popularity during the Centennial celebration of our nation's independence, and remained extremely (and deservedly) popular on these shores through well after WWII. 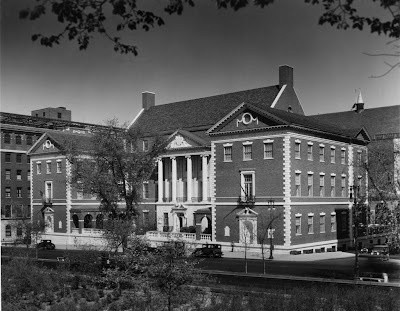 It is still admired, practiced and appreciated in certain traditional, classically-inspired circles here in America, notably by the members of the most worthy Institute of Classical Architecture & Art, which co-sponsored the show. 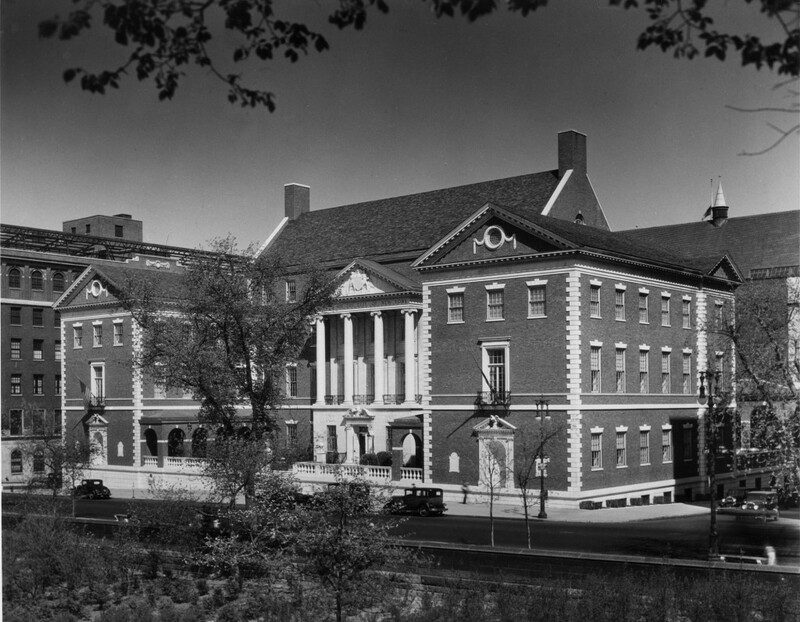 The American Colonial Revival is one of Reggie's favorite periods and styles, and was, in fact, the subject of one of his very first forays into the blogosphere, when he was graciously asked by the inestimable Emily Evans Eerdmans to do a guest post on her eponymously-named blog about rooms that have most inspired his own, personal decorating. I selected as my subject two Colonial Revival rooms in houses owned by Historic New England (formerly—and more elegantly—known as The Society for the Preservation of New England Antiquities). 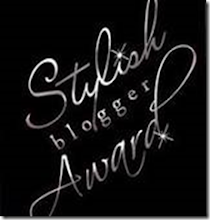 You can read that post on EEE's blog here. 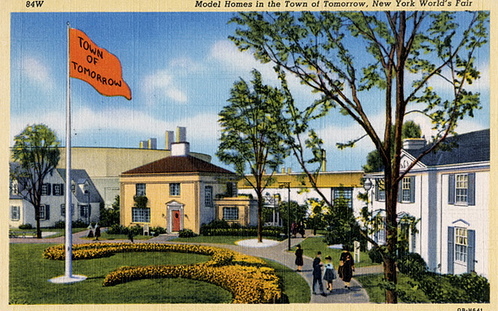 A vintage postcard of the Colonial Revival "Town of Tomorrow"
The show at the Museum of the City of New York is jam-packed with photographs, objects, and examples of the decorative arts from the Colonial Revival's heyday, and is an absolute treat for those of us who appreciate such things. The exhibit features numerous reproductions made during the period, some completely accurate and others, well, "inspired" by the originals. 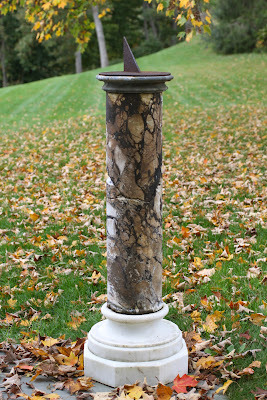 There were several reproductions of Duncan Phyfe seating furniture in the show that were so perfectly done (and so perfectly patinated) that Boy and I initially assumed they were original, made in the first quarter of the nineteenth century, and not made one hundred years later, as they were, by W. & J. Sloane. Examining them gave us pause to wonder whether some of the furniture in our own collection at Darlington House attributed to Duncan Phyfe (or one of his competitors) could quite possibly actually be later, very good reproductions. Despite the admittedly uneasy feeling such considerations gave us, we still loved the show and I urge you to go see it for yourself, Dear Reader, before it closes this Sunday. I'm Just a Cockeyed Topiary Optimist! As readers of this blog may recall, Reggie isn't very lucky when it comes to caring for topiaries—those charming, impossible-to-sustain, diminutive potted standards sold by swell florists and specialty growers to those of us weak-willed enough to succumb to their siren call. I've written about my failures with keeping such darlings alive, despite my most earnest efforts to, here and here. But, being the optimist that I am, I never seem to figure out that buying yet another topiary (which for me actually means buying at least two of them at a time, since they look best in pairs) will lead to the inevitable death of said plant. For under my care death is what their fate will most assuredly be, despite my best efforts otherwise. I've killed countless dozens of them over the years. 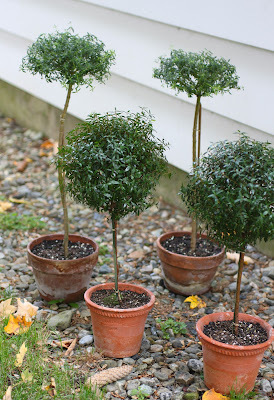 This spring, at the Trade Secrets garden show held annually in Sharon, Connecticut, (founded by the inestimable Bunny Williams) I bought half a dozen new pots of topiaries from Atlock Farm, one of the vendors showing there, to replace the topiaries I'd murdered over the previous winter. I did so with the newfound understanding that my approach to owning and caring for topiaries had theretofore been flawed. In the past I had erroneously thought that I could keep them alive for months (if not years) with careful and loving treatment. I had also considered that my inability to do so was, well, a failure on my part. Not so, one wise reader, named Flo, advised me—I was in good company because it is virtually impossible for mere mortals such as Reggie to keep such tender lovelies alive over the winter in a northeastern house, particularly one such as Darlington House that is lived in only on weekends and where there is no temperature- and humidity-regulated greenhouse for the topiaries to vacation. Just think of a topiary, she wrote, as an expensive potted plant that has a limited life span, and enjoy it as such. Such freedom! I now understood that my topiaries' withering was as inevitable as the tides rolling in and out, something entirely beyond my control. That is, unless I were Bunny Mellon, famous for—among other things—an extensive collection of perfectly cared-for topiaries, acres of greenhouses, and armies of gardeners charged with ensuring said topiaries' long life. As I've pointed out here before, I am, most assuredly, not Mrs. Paul Mellon. Of the half dozen topiaries I bought at the Trade Secrets show this spring, four remain with us, having survived a summer of mostly benign neglect on our screened porch at Darlington House. I am showing them, ahead of our bringing them indoors for the winter, pruned (by Boy) of their late-summer shagginess and returned to their desired, perfectly coiffed profiles. They are resting behind our gardening barn in the shade, after having been rinsed and sprayed, awaiting their transfer into the house. Even though I know there is scant hope that these topiaries will survive until spring under my care, I still hope and wish that they will, despite the odds stacked against me. I just can't help myself. I'm a tender-hearted optimist when it comes to such things. And that is why there will always be a demand for nurseries and plantsmen to bring fresh batches of topiaries to market every spring—because of cockeyed optimists like Reggie who, when confronted by a new topiary deludes himself into believing that he might be able to, this time, nurture it from one year to the next. And because I am aware that such optimism is foolishness on my part, I know that I will return to the Trade Secrets show next spring to, once again, replenish my stock of topiaries, continuing the never-ending cycle . . .
As I have written in past posts, one of the (many) things we collect at Darlington House is early-nineteenth-century pearlware figures of deities and virtues. 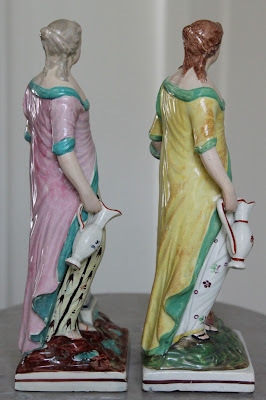 Made in Staffordshire, England, from 1790 to 1825 or so, the figures, which are almost all dressed in classically inspired garments fashionable at the time, were largely intended for the domestic English market, and relatively few of them were exported to the Americas. 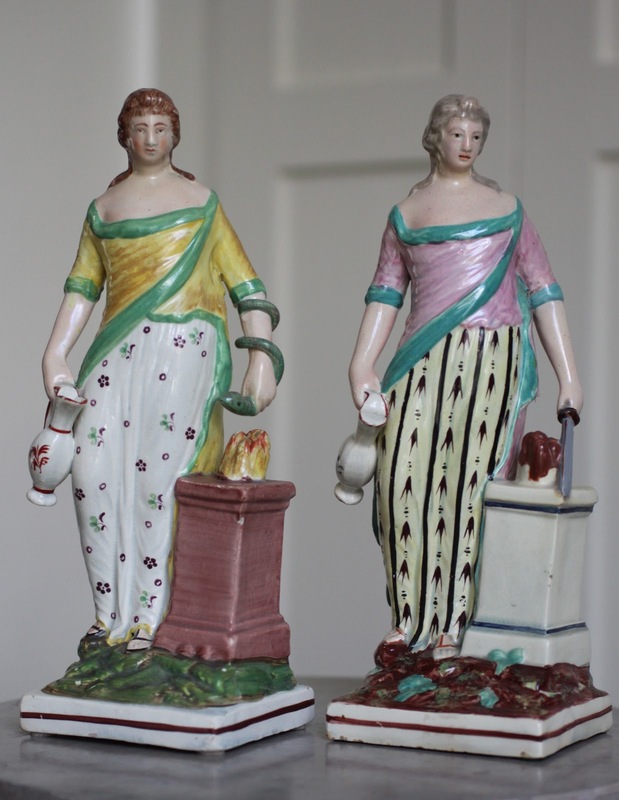 We have been collecting such pearlware figures for as long as we have owned Darlington House, and we keep a determined eye out for them whenever we visit antiques shops, antiques shows, and auction houses. As readers of this blog well know, we frequent such places rather a lot, and doing so is one of our favorite pastimes. But we only rarely come across these figures. Although we see mountains of later, Victorian-era Staffordshire figures whenever we are out and about, the earlier classical figures seem as rare as hens' teeth here in the American northeast. We go to a lot of shows and visit a lot of dealers and shops, but we probably only come across one or two—maybe three—examples in the course of a year. And when we do, we more often than not already own a version of that figure. 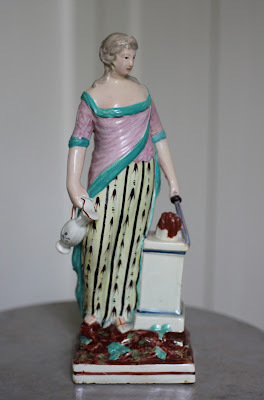 Several weeks ago, when out in the town near Darlington where we do much of our shopping, Boy came across a pearlware figure that we did not already own, in perfect condition, in the shop of pickers where we have had much good luck over the years. 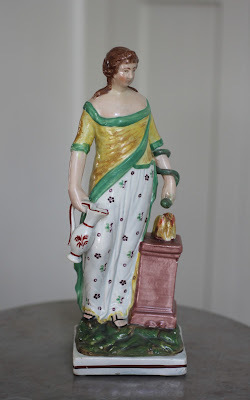 The figure had just come into the shop—a lucky find by the owners at a recent Brimfield Fair—and was exceedingly well-priced. So, without so much as a hesitation, Boy bought her. As we were sitting in the car examining our new purchase, both Boy and I thought the figure in front of us looked oddly familiar. That's not surprising, though, since we probably own upwards of twenty of them, representing various goddesses, deities, and virtues. The figures are all approximately the same height, decorated similarly in pretty pastel colors, and almost all of ours are women (we call them "the Girls"). Only relatively few of such figures depict men or boys, we have found. It was not until we got back to Darlington House with our new figure that Boy realized that we already owned a figure that was almost identical to the figure he had just bought. They both depict Hygieia, the Greek and Roman goddess of good health, cleanliness, and sanitation, and who was the daughter of Asclepius, the god of medicine. 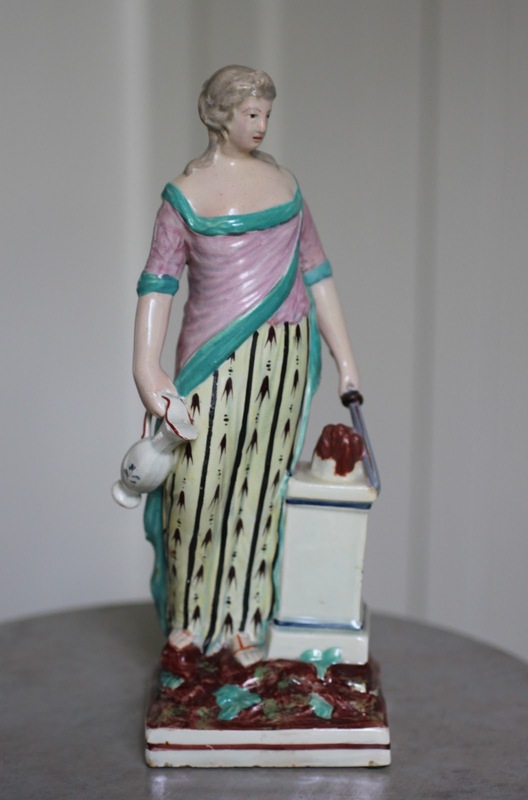 The figure we already had in our collection carries a label from the dealer we bought her from ten or so years ago that identifies her as Hygieia, and we never had any reason to suspect that such an attribution may not be accurate. But when comparing the two figures we noticed that they were decorated differently, in different colors and patterns, and had a minor—albeit significant—difference to their modeling. 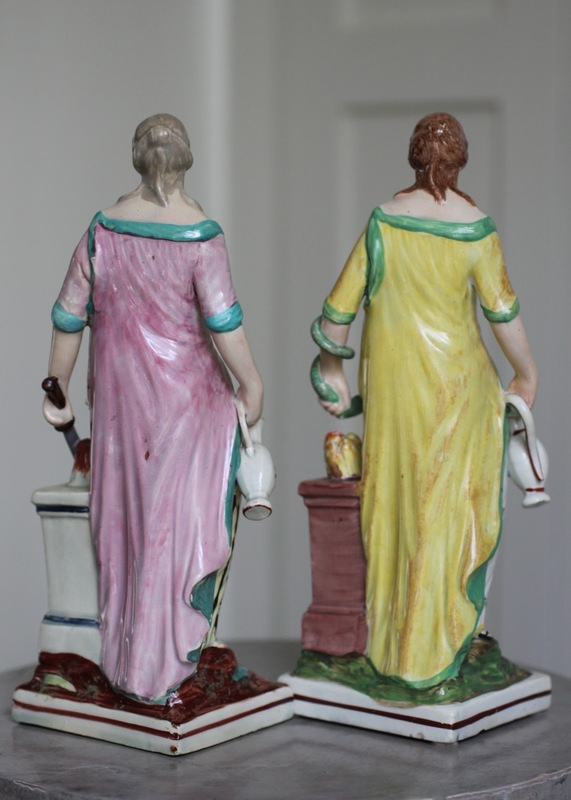 But it was clear to us that the bases and bodies of both figures were made from the identical mold, and were—but for some minor variations—the same, although likely painted at different times by different people working in the same factory. 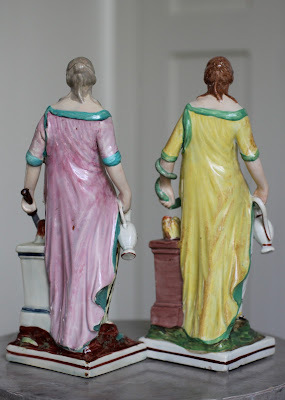 In examining the primary differences between the two figures—what they are carrying in their left hands—I am now not so sure that the figure that was already in our collection actually does depict Hygieia, even though it is the one marked with a label identifying her as such (seen in the photograph of the inside of the figures). 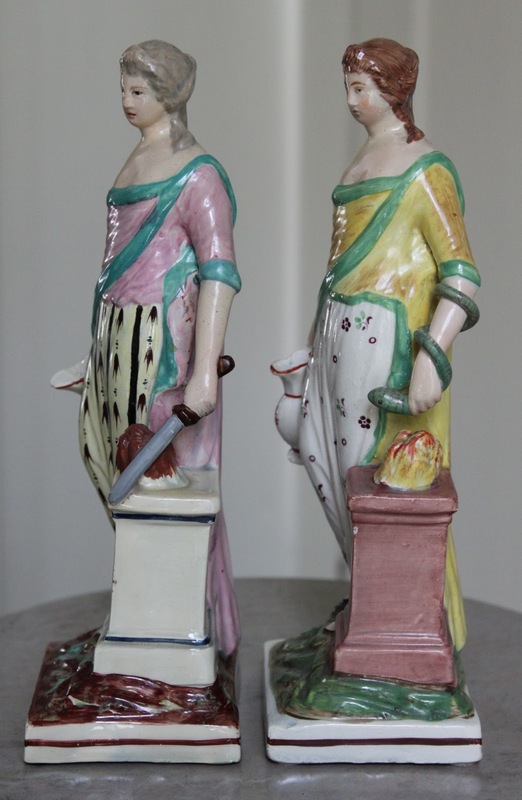 Hygieia, I have since learned, is typically shown carrying a snake, which the figure shown on the right (our "new" one) does. The figure on the left (our "old" one), however, is shown carrying a sword, which is not typically associated with the goddess Hygieia. Furthermore, she does not have the flaming bowl on the top of her pedestal that Hygieia has, frequently seen in depictions of her. Consequently, I am now not so sure that these figures are supposed to represent the same goddess at all. I now suspect that the one shown with the sword (our "old" one) is meant to depict another goddess entirely (could it be Athena? Or the more obscure Enyo? ), and was adapted from the mold originally made for Hygieia, but altered with different accessories (which were applied separately to the molded figure before firing) and painted differently as well. Regardless of whether the figures are of one and the same goddess, or not, I'm delighted to have them both in our collection at Darlington House, and most pleased that Boy spotted the newest addition when he did. 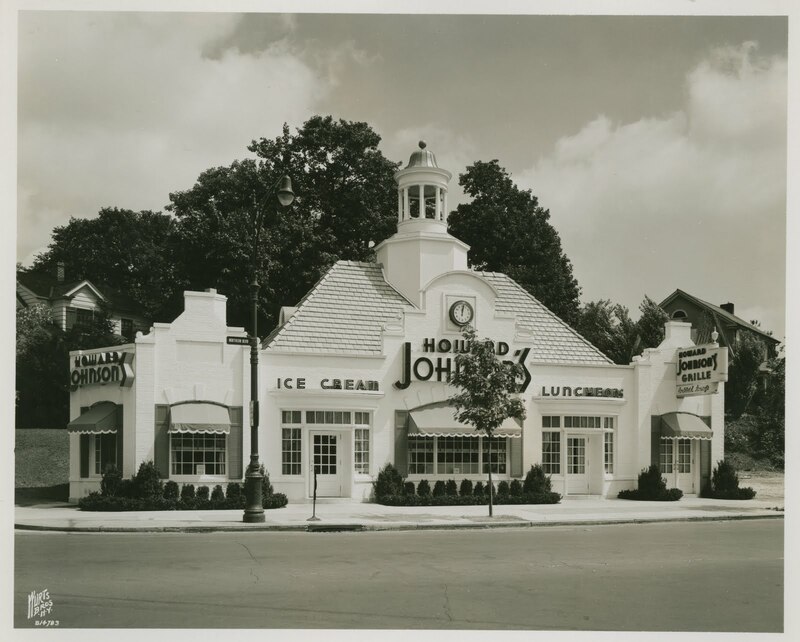 Tell me, Dear Reader, do you think they are both Hygieia? If not, who do you think the goddess with the sword is supposed to depict? The Passage of Time . . . I am afraid that I have been rather remiss in my postings of late, despite my stated intentions to the contrary. A number of you have been so kind as to ask what accounts for my absence and have sent me your good wishes and felicitations. Thank you. I am happy to report that all is well in the Darlington household. My absence from the Blogosphere is largely attributable to a grueling, albeit extremely interesting and absorbing, work-related travel schedule that takes me out of the country and away from ready wifi access for days at a time. When I have returned to my beloved Darlington between my travels I have been much engaged in catching up, relaxing, and recharging my batteries, preparing for yet more international business travel. Once my travel commitments ease up, expected by mid-November, I plan on resuming my more regular posting. 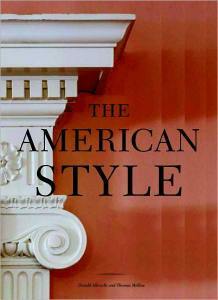 In the meantime, I do have a number of essays to publish that I hope you will enjoy.